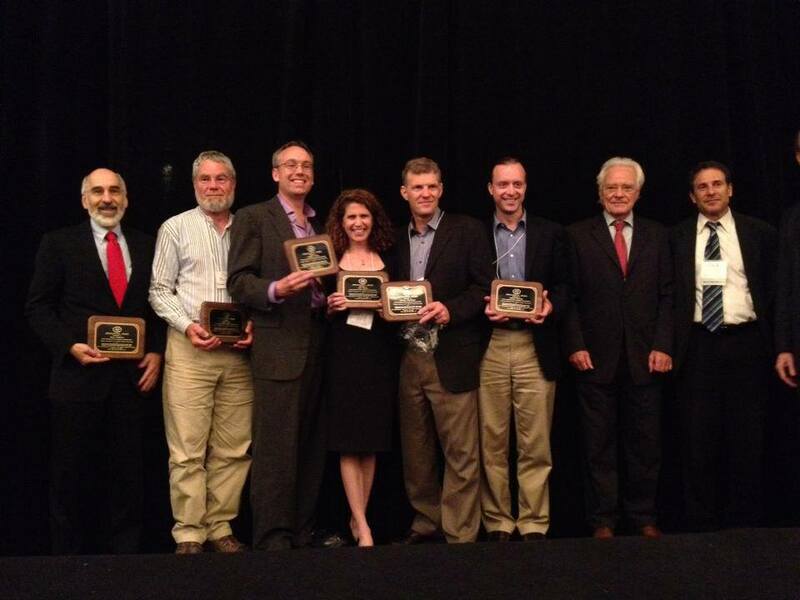 On Tuesday in Cambridge, MA the Climate Interactive team won an award for the Best “Real World” Application of System Dynamics at the annual conference of the System Dynamics Society. The award goes to our work on the C-ROADS climate policy model, which thousands have used worldwide to better understand the level of emission reductions needed to address climate change. The award goes to the authors of the paper about C-ROADS that was published last year in the the System Dynamics Review. I’m Brad Morrison, and I am the Acting Chair of the System Dynamics Applications Award Selection Committee. First, let me say that the System Dynamics Applications Award is presented by the Society every other year for the best “real world” application of system dynamics. The best application is based primarily on demonstrated benefit through the use of system dynamics, and secondarily for new ideas that improve the art of applying system dynamics, or for relating work to existing system dynamics literature and/or other disciplines. The work must have been conducted within 10 years of the submission deadline. Papers must be full-length and written for an SD-user audience, in the English language in the original or after translation, and papers may be self-nominated. You should recognize that this award is one small step towards a need Kim mentioned this afternoon – namely to get good work in system dynamics written down and published so people can find out about it. I have the honor of presenting this award on behalf of the Committee, who include Jack Homer, Mark Paich, Kim Warren, and Erich Zahn. I should say that to avoid any appearance of a conflict of interest, I excluded myself from the deliberations until the winner was selected. 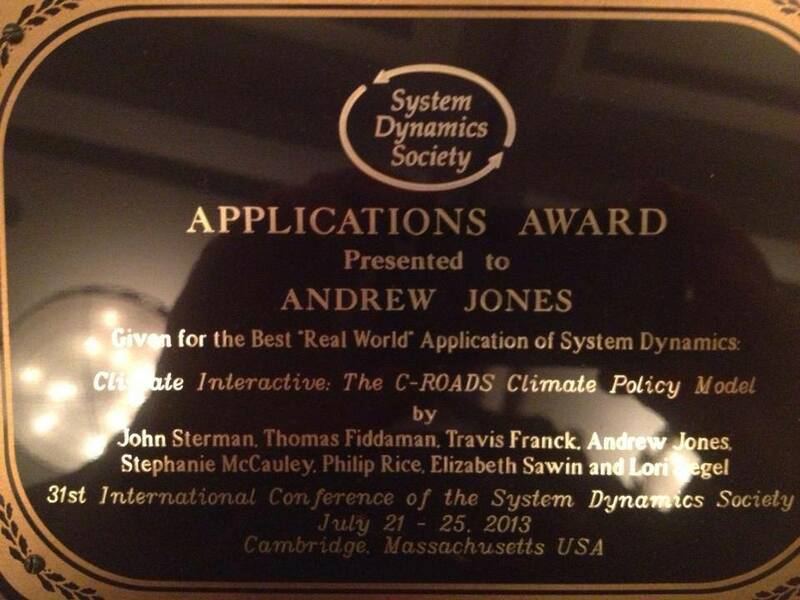 Now, it is my pleasure to announce the winner of the 2013 Applications Award is “Climate interactive: the C-ROADS climate policy model” published in the SDR in 2012. The authors are John Sterman, Thomas Fiddaman, Travis Franck, Andrew Jones, Stephanie McCauley, Philip Rice, Elizabeth Sawin and Lori Siegel. I would like to invite them up here now. Due to program considerations, I am supposed to be brief. We heard an excellent talk this morning based on this work, we have all now seen first-hand what some of the merits are, and they highlighted this so much better than I could, so I need not say much more. But, a little background. The paper we are recognizing is one piece in a long and ongoing stream of work that goes back at least as far as Tom Fiddaman’s doctoral thesis, which was the beginning of the C-ROADS model. The team developed a fast, transparent model, grounded in the best available science, that would allow users to understand the implications of their own assumptions about the future path of global green house emissions. The lack of such a model had been a huge impediment to the development of a shared understanding about what was needed to achieve global and bilateral agreements, and to motivate action that can reduce GHG emissions. Policy makers and climate negotiators themselves said they had no idea what the actual consequences would be of the climate pledges they were making, and in particular, did not understand how woefully inadequate the proposals coming to the table really were. The point was, quite explicitly, to make an impact by putting a real-time model in the hands of policy makers – and the general public – so they could use it to develop a better understanding. I’ll just quickly mention three things I have found quite distinctive about this work. To explain the first, I want to tell you the reaction I had several years ago when I first saw this work. I was really amazed at how they had set the boundary for the model. I thought they had completely ignored all of the important feedback between human activity and the climate. They left out the effects on the global economy and paid no attention to HOW we might go about modifying future emissions. I thought “How can they get away with this?” I have now come to realize, with the benefit of hindsight, that this a stroke, or perhaps even a large dose, of brilliance. By stripping away all of the controversial social “stuff” they were able to focus on the basic science which was not controversial, which of course they got validated by an independent panel of climate scientists. But, this smaller model was able to effectively meet policy makers “where they were at.” They recognized there was still great insight to be had , Although they have gone well beyond this beginning in their continuing work to extend to model and enhance its usefulness, I believe that strategic choice at the start made it more accessible and significantly accelerated the penetration they achieved among target populations – especially influential policy makers and thinkers. Second, this is a great example of how a team of people with a variety of skills came together to focus on a problem about which they all share great passion. Although a system dynamics model is at the center of what they have accomplished, there are many other components to it. Creativity in finding ways to communicate, development of an engaging role play exercise using the model, meticulous collection and analysis of relevant data, promotion and marketing of their message , management and coordination of their efforts – all these and more have played a role in advancing the cause. Finally, this a work that has made an impact. We heard this morning about impacts on the rich and powerful. We heard about the effect they have had on at least one wealthy and powerful spokesperson. There are also chronicled success stories of influence they have had on John Kerry, then Senator from MA now the US Sect of State, on the US Deputy Special Envoy for Climate Change Jonathan Pershing, briefings of senior members of the Obama administration, and many more key individuals. In addition to the US, other countries including China are now using the model. But more broadly, they have worked tirelessly to make it all available to the general public through the Climate Interactive website and other means. I could go on and on, but I think you get the point. Please join me in congratulating the team for their great work with real impact.